Old fashioned city pub with old fashioned crowd - ale was drinkable rather than good. Saw a gig by the excellent Benji Kirkpatrick and the Excess the other night. Had a few pints on Derby stout which was on form. A good evening. Gents bog still stinky though! C'mon Laura, sort it out. On the edge of the Georgian Quarter, this pub should benefit from the gentrification of the area. I was going to have only one pint but stayed for three. The Ship & Mitre Silhouette should cut down on my Guinness intake in future! When I was there (a Wednesday) there was a three-piece Cajun band, who reminded me how closely related that style is to Irish music. Also a cut above the one-man-and-his-guitar types around the Cavern Quarter. Strongly recommended. 5 ales on when I was in, including Prainger Danger which was very pleasant and priced at 3.40. Reasonably quiet on my visit, quite dimmly lit, gives it a bit of 'ambiance' I suppose, Christmas music on in the background as well. Okay but not as busy as expected, no indication of any bands intending to play, may be it has an extra room for this, I didn't see anything though. Worth a vist. 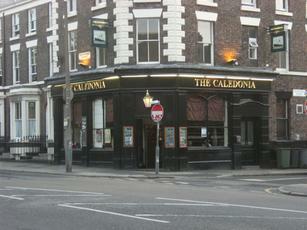 The Caledonia was much busier than on our last visit and was seemingly more popular on a Sunday evening than many city centre pubs. This was no doubt helped by a jazz band performing. Live music seems to be a feature on most days know and this is obviously a big draw for the large student crowd. The ales were Plassey New World Pale, Empire Mad Dogs and Englishmen & Burscough Hold Your Plums. Cider was Orchard Pig Explorer. There were also some craft beers. I tried the Tickety Brew Coffee Anise Porter, which was quite frankly awful - the first craft beer I have tried that was off, despite being served at a cold temperature. An unusual feature was a vending machine selling cans of 3 kinds of Heavy Industry beers. At £3.80 each, we decided not to partake. I'll give the pub the benefit of the doubt, despite the poor quality beer. This is still a pub I should probably visit more often.